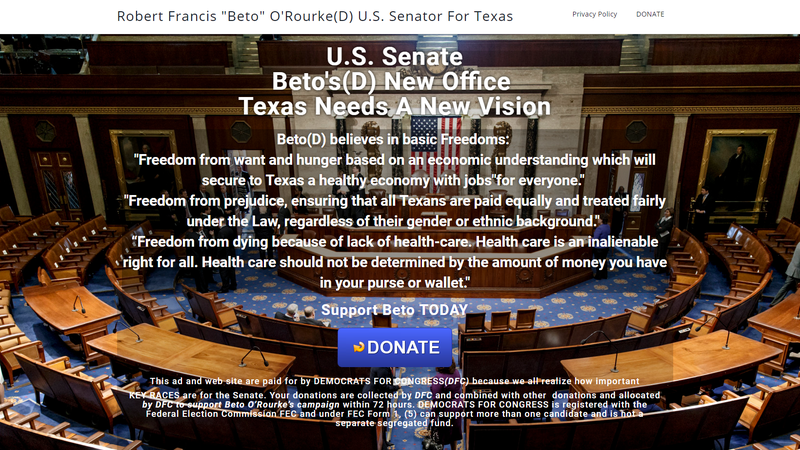 A screenshot from “beto4senate.org,” which prosecutors allege was one of the sites John Pierre Dupont set up to scam political donors (and which to be clear, you should not visit and hit the “DONATE” button on). Federal prosecutors have charged an 80-year-old California man named John Pierre Dupont with bilking donors out of more than $250,000 by setting up fake websites and political action committees (PACs) falsely purporting to raise money for Texas politician Beto O’Rourke, Vermont Senator Bernie Sanders, former Tallahassee, Florida mayor Andrew Gillum, and other progressive causes, NBC News reported Tuesday. In a press release, prosecutors alleged that the scam ran from 2015 until Dupont’s arrest in March 2019, during which “None of the money raised went either to those campaigns or to support those candidates whatsoever.” They also say Dupont never reported the donations to the Federal Election Commission as mandated by law, instead using the funds to pay for personal expenses including rent, parking and traffic tickets, and a $25,300 Mercedes-Benz sedan. The Sanders Website stated that: “EVERY TIME WE PROCESS YOUR CREDIT CARD DONATION, THE BIG BANKS TAKE UP TO 40% OF THE DONATIONS JUST FOR PROCESSING YOUR CREDIT CARD DONATION. . . THAT IS WHY WE ARE GIVING YOU THE OPTION . . . TO MAKE YOUR DONATIONS IN CASH OR CHECK BY SENDING YOUR DONATION” to a particular address. Sanders was the star draw of the alleged scam, accounting for some $140,000 of the illicit gains. In the criminal complaint, United States Attorney’s Office, Southern District of New York special agent Jeremy Rosenman wrote that all of the sites were registered by the same web hosting account, which was tied to the defendant’s real name. On one of the websites, the word “Democrat” was misspelled, while on six, the “same lengthy quote” was attributed to “the relevant respective candidates,” he added. According to the Star-Telegram, “Many of the sites appear to still be online, all with the same template and a large button to “DONATE” to the candidate or cause.” Additionally, the paper wrote, the web hosting account associated with those websites registered others that suggest Dupont planned to cash in on 2020 hopefuls including former Vice President Joe Biden and New York Senator Kirsten Gillibrand. NBC News described the defendant as a “once wealthy financier” formerly named John Gary Rinaldo, and who appears to have quite the con-man résumé. His rap sheet includes a 1985 guilty plea in a mail fraud scheme that “fueled investment losses in the tens of millions of dollars,” a 1991 conviction on mortgage fraud, a 1992 escape from a “minimum-security federal prison in northern Oregon” he was transferred to after testifying in a “Mafia-related” double homicide trial, and two years in prison following his recapture in 1997, per NBC. According to the DOJ press release, Dupont has been charged with wire fraud as well as aggravated identity theft, which could land him sentences of up to 20 and two years respectively if convicted.